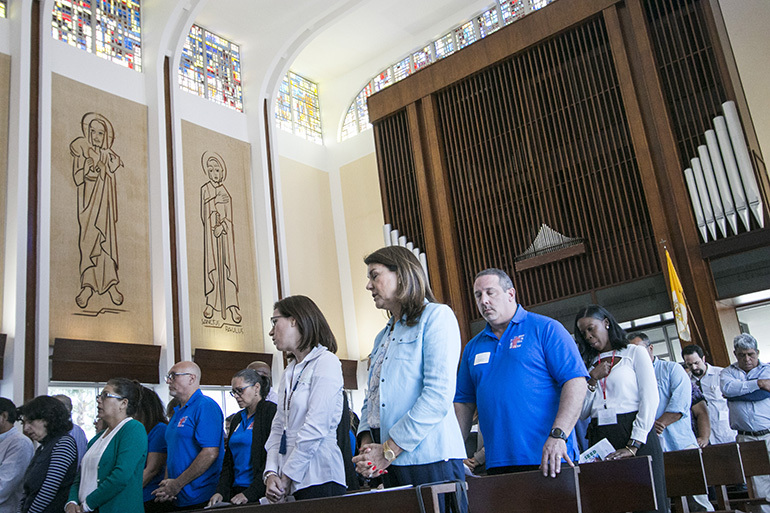 Archbishop Thomas Wenski preached this homily to participants at “Planting the Seeds,” the first archdiocesan Stewardship Day, held April 14, 2018 at St. John Vianney College Seminary, Miami. Thank you all for being here for this Stewardship Day. In today’s Gospel, Jesus walks on water. Kids today would say, “Like, how cool is that?” The apostles certainly were awe struck — but they were afraid too. Jesus has a way of doing that to people: the call to discipleship is not for sissies. Jesus certainly is kind and merciful but he is also demanding. “Come follow me” is more than just an invitation to a picnic. It is a call to identify ourselves with Jesus and his saving mission by our taking up the cross. It is a call to conversion of mind and heart. It is a call to make yourself a co-worker with Christ in his vineyard. If taken seriously, this call can be a bit scary — if I follow Christ where will I end up? 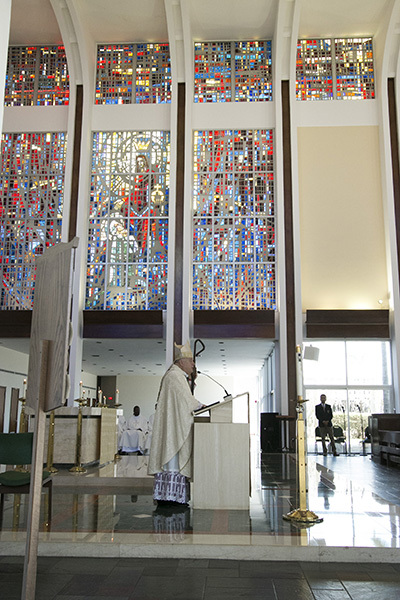 Archbishop Thomas Wenski preaches his homily during the Mass at St. Raphael's Chapel on the grounds of St. John Vianney College Seminary in Miami. More than 150 representatives from dozens of parishes gathered at St. John Vianney College Seminary April 14, 2018, for Planting the Seeds, the first archdiocesan stewardship conference, sponsored by the Development Office. So, what does this have to tell us about stewardship? Stewardship is not just a way to increase the Sunday offertory, it is not about fundraising. Stewardship is not a program; it is a way of life, it is the way of life of those who have opened wide the doors of their hearts to Christ. In that sense, we can say that stewardship is not all about money but our money — and the way we use it — is all about stewardship. To say that we are “stewards” is to say that we are not the “owners” of our time, talent or our treasure. The only things we can rightly claim to own are our sins. Everything else belongs to God. But God does make us “managers” or “administrators” of what is his to act on his behalf. The Second Vatican Council, I think, identifies what being a steward is, when the Council Fathers say that one can only realize himself or herself through the sincere gift of oneself. In other words, the secret to a fulfilled and fulfilling life is found not through self-seeking or self-assertion, but through self-giving. I think we could call this the Theology of the Gift. So, stewardship is how we in the Church translate into reality the theology of the gift. Like I said, stewardship is not just a program, it's a way of life — it is the way in which we realize ourselves, the way in which we become the persons that God made us to be, through the sincere gift of ourselves. The Spirit inspired great creativity in the early Church: Deacons assured that the Gentile widows and orphans would not be neglected. A Spirit-inspired sense of stewardship will help us as a Church today to respond adequately to the needs of our people today. We face many challenges — sometimes it seems that the boat is rocking — but we are not afraid. Jesus will bring the boat ashore; his presence calms all our fears. More than 150 representatives from dozens of parishes gathered at St. John Vianney College Seminary April 14, 2018, for Planting the Seeds, the first archdiocesan stewardship conference, sponsored by the Development Office. Here they pray during the Mass celebrated by Archbishop Thomas Wenski.